I’ve been quiet about the mullet project lately, so feel it’s time for an update. Over the past couple of years enough people (not to mention newspaper articles and radio interviews both here and in Australia) have persuaded me that the mission would make a good book. So some time ago I decided to write it all down. The quieter pace of life I have enjoyed down here (thanks to a job that allows for proper work-life balance) has meant it’s been possible to put the last few years’ experiences down on paper screen, something I just never had the time or energy to do in Inverness. The story is now written up to the present day, and in the past few weeks I have begun pitching it to literary agents in the hope that they can find me an interested publisher. However the publishing industry is fiercely competitive, so any success will take time. And nothing is guaranteed – there’s a lot of very good, very funny travel writers out there, and I have no idea if I am up to scratch. But in its current format – using my annual leave to visit an average of one country a year – the mission is very slow, expensive and unsustainable. 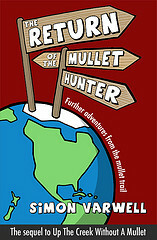 The remaining mullets are in Canada, the USA, Mexico, the Caribbean, the Falkland Islands, New Zealand and Albania, and it would take an agonisingly long time to finish it off on that basis. Given that I keep inadvertently discovering new ones, I could be a pensioner before I get round them all. And frankly I want my life back. I have reached the conclusion that I am going to have to take the plunge and just finish it off with one big round the world trip over several months. This does of course involve quitting my job, and so just the other day I notified work of my likely intention to this. 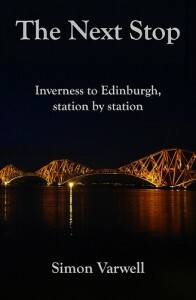 Now I’ve done that I feel I can go “public” about my provisional plan to head off travelling in September. It’s not all as simple as getting my P45 and packing a bag, however. There’s also the small matter of money. And how long I travel for, and on what route. And what I do when I come back. And where I come back to. And just how safe is Haiti? Much thinking and planning to do over the coming months. Thursday 15 February 2007 in Mullet hunting, Travel. Wow, that is both really exciting and brave. Best of luck to you. If you find yourself in the US around wherever I will be in September, be sure to say hi. One question – how did taking on this project take away your life? Good for you – these things just have to be done!! 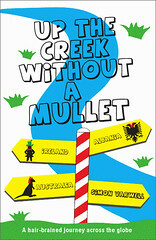 Varwell, first you sacrifice love and now you sacrifice your career – for mullets! Can’t you just take a sabbatical? How are you going to explain to the UN peacekeepers in Haiti that you’re just there because you like the name? Is this the only way you can make peace with yourself for the awful truth that you too had a mullet in your late teens (and I have the photo to prove it)? Yo Varwell, I must admit, I admire your balls. I also think that its a very brave decision, and you’d always regret not doing it if you stayed. Don’t listen to negative Nevvy, he has taken lots of risks and I’m sure he doesn’t regret a thing. But mostly, I admire your balls. I think your balls are great too. On review, after considering curry-thief Mark’s sage views, I think you should absolutely go for it. You’re only young once and this is the time to do it. You won’t regret it. Unless you get killed of course. I didn’t steal the curry, they gave it to me! I feel that nevs attitude towards theft is a little skewed. After all, this is the guy that stole an entire box of paper chefs hats, to distribute amongst revellers in Aberdeens underground dance scene. Now, wait a minute Marky, there is somewhat of a difference here. You walked out of a curry house, curry in hand, without having paid and fully aware of it, taking advantage of the restaurant’s mistake. Later that night I have no doubt someone is that restaurant suffered as a result of your unthinking, crass ways. However, the chef’s hats I “stole” were cheap crap paper hats sitting unused for a long period of time in a storeroom, and were blatantly never going to be used by real working chefs in a kitchen. I merely liberated these hats, from a future otherwise destined to the bin. At least we agree on the balls. Now now boys, have your arguments somewhere else. Jenny – how did the mission end up taking over my life? Well… that’s a long story. I’ll tell you when I come visit you in the USA! It has to be done. Mind you I still think you are mad but so are we The Mulletts of this land nutty as fruit cakes.